Thanksgiving is upon us - almost! And as I've mentioned before in this blog, to my family, Thanksgiving is (probably) our biggest holiday! Not because we make the best food ever, or because we decorate in an amazing way. But because we believe in what the tradition means. To us, Thanksgiving is about being with family and friends and sharing thanks for all that we've been given. And we always sing the hymn, We Gather Together, before we say grace and dig in. Its just one of the many traditions we have surrounding this holiday that I love. Having said this, Thanksgiving is also a GIANT party in our family that starts on Wednesday and goes through Sunday, and that's thanks to my grandmother. She had two kids, my mom and my Uncle Fred. Grandma, in her brilliant mind, said that she didn't care what her two kids did for Christmas, as long as she got Thanksgiving. Thus ensued a now 57+ year tradition of both sides getting together, that except for a few years, we've been able to maintain by celebrating with my cousins and now our collective kids and Grandma's great-grandkids. That amounts to a 30+ person reunion almost every year, even if it doesn't always exactly fall on Thanksgiving. Pretty awesome tradition if I say so myself! I'm on the left with my cousin, Jon, who I call "Danny", because of a night in a bar when I was with my cousin, Annie (the one with the checked pants and snazzy floral jacket). 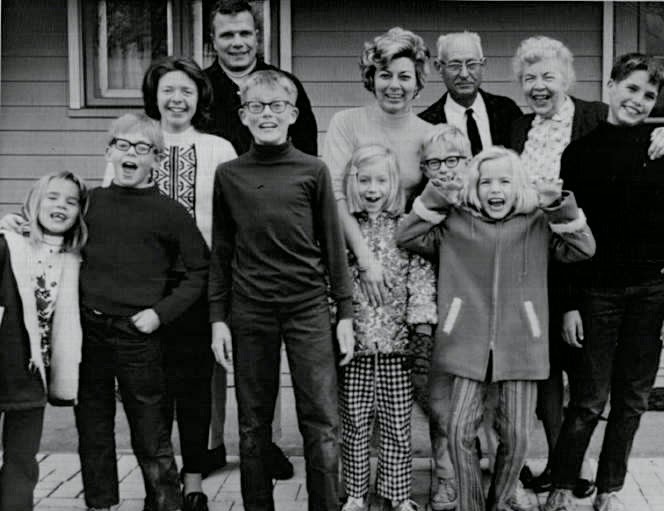 Long, funny story, but the "Nanny, Annie and Danny" crew along with our Grandma, whom we renamed "Grannie" on a different night in a bar, (she was with us and telling tales even we were forbidden to share with our parents) have seen lots of good times and especially on Thanksgivings! And what started as the little kids watching their parents have all the fun, has morphed into the "kids", (us - boy, we're old! ), with our own kids and a lot of the generations all having far too good a time than should be legal. And sometimes its not - oops! Silly us, I guess driving on the sidewalk and stealing fish from a pond constitutes as illegal in North Carolina! Sadly this year is one of our rare "off" years, but that won't keep me from celebrating, even if its on the small side. 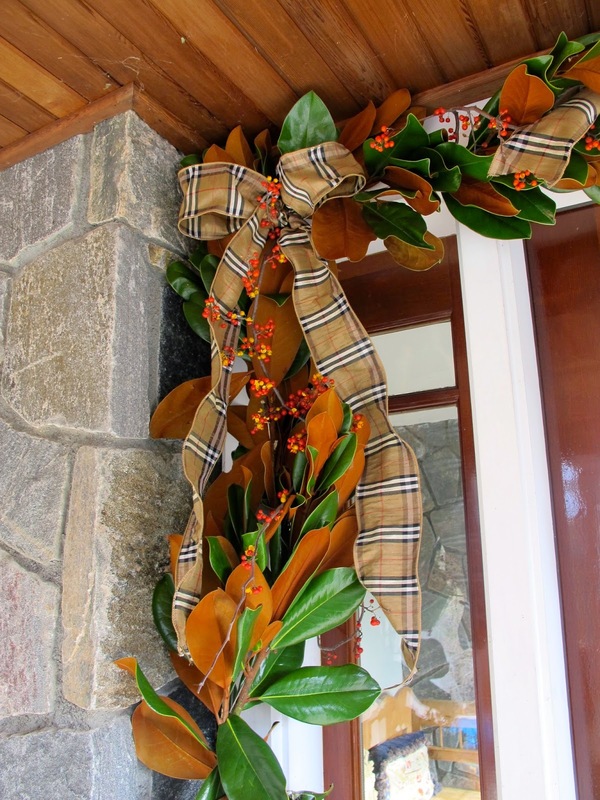 And its also not going to keep me from decorating…for Thanksgiving! It was cold this morning (and apparently I need to dust my dashboard), but my grand-puppy, Oakley, and I had some foraging to do. We went to the flower market and got some Magnolia leaves. Since we don't live in the South, we can't grow them up North. Then we went to the farm stand and got some Indian corn - love the colors! And then I had a talk with Oakley about keeping her eyes open in case someone didn't want me clipping stuff on town property. She agreed, because she loves me. Yes, I will probably be (or am) one of those creepy ladies on the side of the road, risking life and limb, for a clipping of something unusual. You've been warned! But my hat's off to this guy who wanted one last row in his canoe before it got too cold! I hope he's wearing a lifejacket! After compiling my supplies, including the necessary Diet Coke and Pretzel M&M's, I set off to decorate. Nothing I do is very complicated. 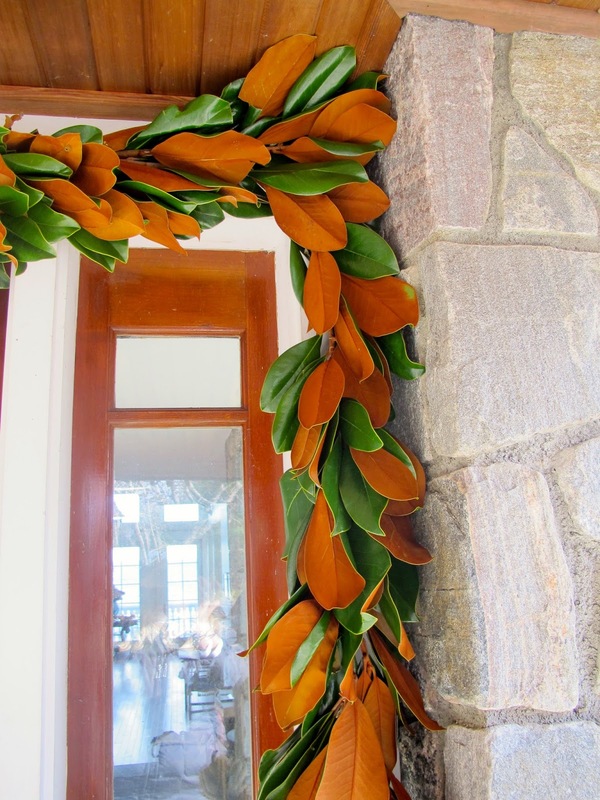 And in this case, I'm making a pretty garland using magnolia leaves for my front door. 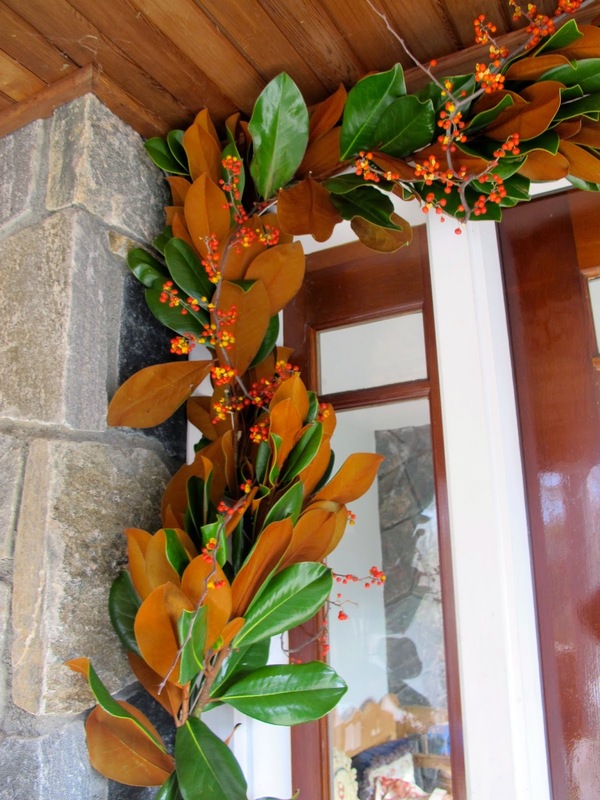 I once made a garland for my cousin Annie, because she's lucky enough to have a giant magnolia tree in her Greensboro yard. And ever since I made her one, I've always wanted one for my house too. 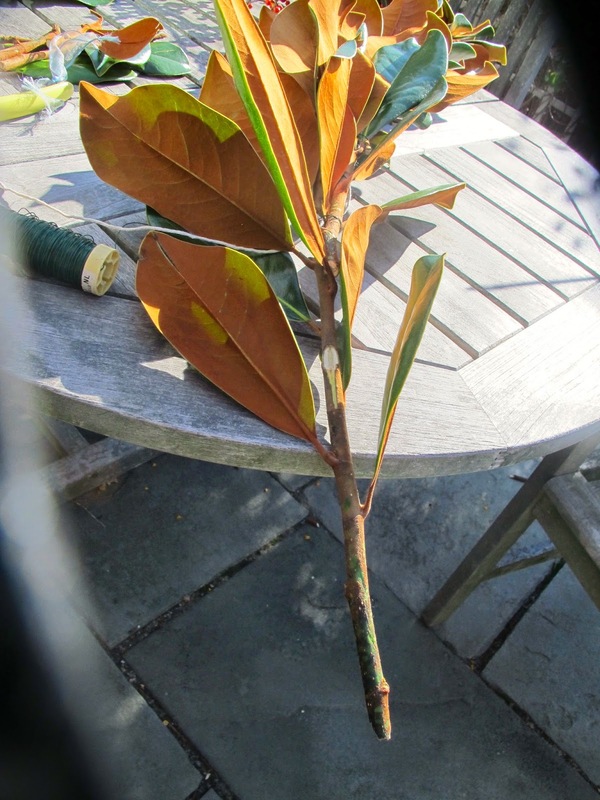 I started with a stem of magnolia leaves and clipped them into two smaller bunches. Some stems are really full and you don't need to cut them. Others have a sort of empty space in the middle so its easier to cut them and wire the fuller pieces closer together. I took out the big empty piece of stem that would've been in my way. Starting with the twine, I made sure I had a long tail on the end in case I needed to tie it to something. Then, pulling the twine along the backside of the leaves, I wired the bunches together to the twine and began to make a string. Basically, all a garland is, is a collection of bunches of greens that are attached using wire to some kind of string. Really easy to make, it just takes a little time. …and how I try to keep the twine running only along the back. Its just so you don't see the twine. The green wire blends more easily. I keep the twine in a ball and pull it out from the center as I move along. I also unroll the spool of wire as I continue down the string of garland, always maintaining pressure and keeping it tight as I pull and wrap. You don't want all your hard work to fall apart once you hang it up! Its getting longer and longer! 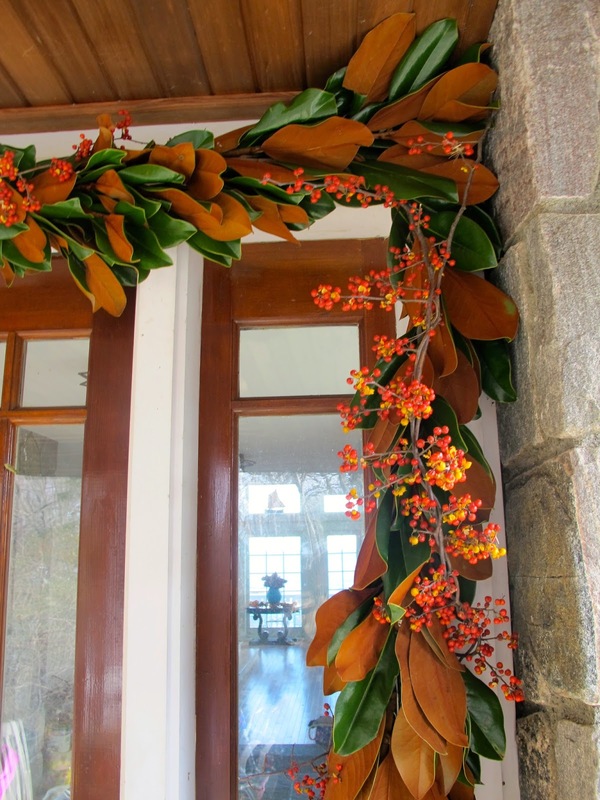 I used a rope and measured how long I wanted to make my garland, so I knew when to stop. 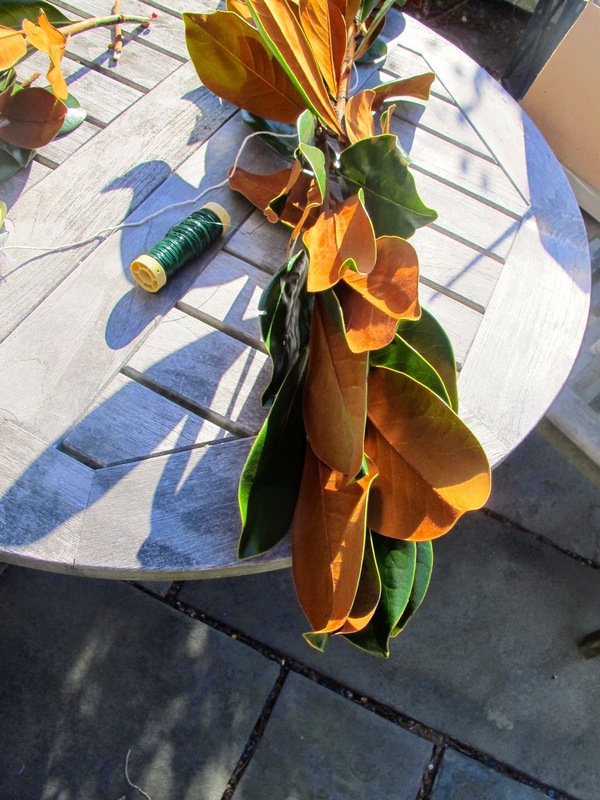 …so I just inverted a bunch or two of the magnolia leaves and wired it to the twine facing in the opposite direction and then it was complete! After finding the center of the garland, I hung it over my door. 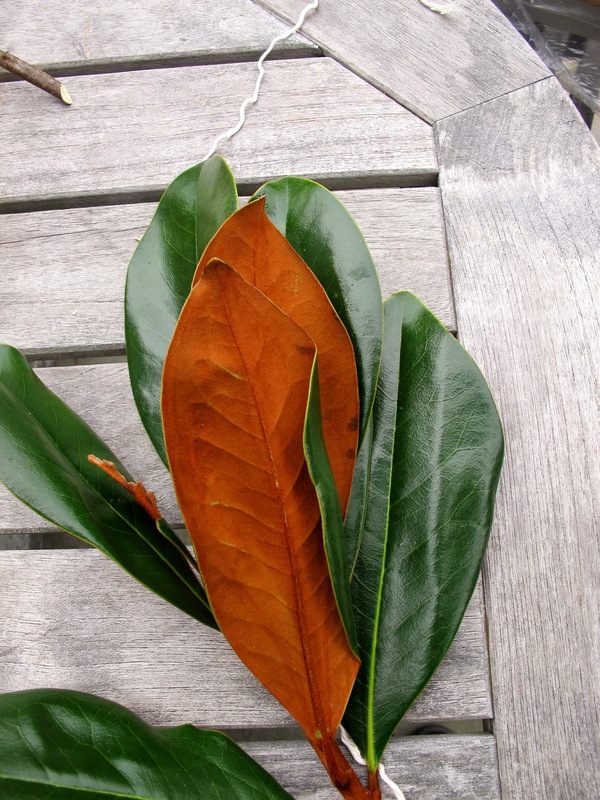 Aren't magnolia leaves beautiful? I LOVE the shiny green on one side, coupled with the mustardy-brown on the leaf's backside! See the pumpkin topiaries are still hanging on (although not for much longer) http://www.bloomingblog.com/2014/10/pumpkin-topiaries.html. Now I can add the garnish! All I did, since the bittersweet vine was so curly, was to gently wrap the stems amongst the leaves. Be careful, because you don't want all those cool orange berries with their yellow coats falling off! 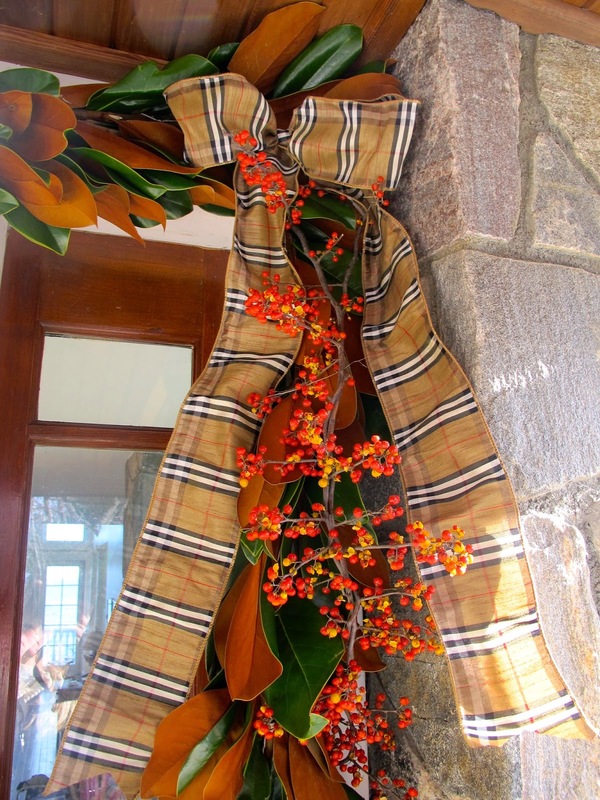 I found this STUNNING faux-Burberry ribbon and thought it would add the perfect, final touch. 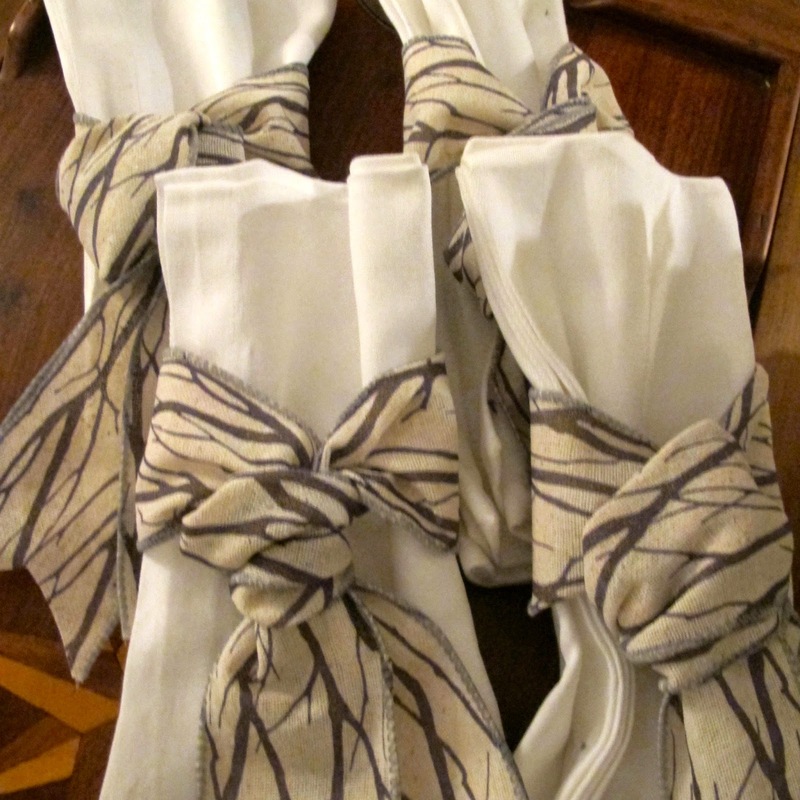 Have I mentioned yet that among my addictions is one to ribbon? …and then I started to beribbon the corners. I'm weird, I know, because I could look at this all day! After the corners, I put a nice big bow in the center and wove the dovetailed ribbon through the leaves and bittersweet. I didn't want to cover my beautiful corn. And before I finished, I had to dig out the good ole' standbys -the turkey sculpture and turkey vase made by my kids back in art class, along with my Annalee pilgrims, pilgrim mice, and turkey. Gobble gobble! Wishing you all the most wonderful Thanksgiving! "Oh the weather outside is frightful…"
Well, not quite. But it IS getting colder! So, to go along with my snow flowers arrangement, (http://www.bloomingblog.com/2014/11/snow-flowers.html, I decided to make a boozy, cheesy fondue. And because the flowers were white, I decided to keep the white theme running through the food too - all but the sausage, 'cause a girl's gotta eat some meat! I didn't originally intend for it to be as boozy as it ended up, but alas, that's the story of my life. ...I decided that we should celebrate the cold! I actually LOVE the cold so its no big deal. we're not only ready, but we're snazzy too! So to start my meal, I compiled all the ingredients. The recipe will be at the bottom, so don't worry! Second, I cut the small gold potatoes into bite-sized pieces and then placed them back into the steam bag they came in (gotta love modern convenience at the grocery store) and sprinkled a good amount of salt and pepper in the bag and stuck them in the microwave for about eight minutes. I cut up cauliflower florets in easy dipping sizes. Next up, mushrooms! Being the daughter of a mother who grew up in Kennett Square, PA, mushrooms are pretty much a staple of every meal in my life (plus they're white). I popped the stems out and then cut them in quarters if they were really big. Okay, so there's a little green here, but the apple is white. 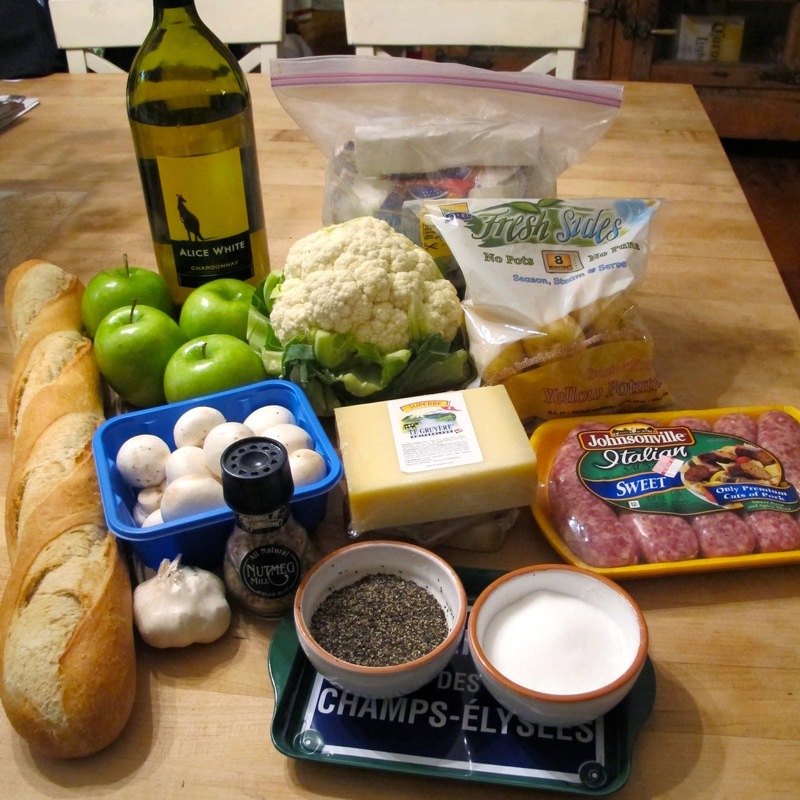 I cored and sliced these and they are so great with cheese fondue! LOTS of cheese for the fondue. 1/2 pound of Gruyere and 1/2 pound of Comte, plus a little more so I could just use the whole block - I'm really scientific in my cooking - ha ha! To start, I rubbed the inside of the pot with cut garlic cloves to add some flavor and then poured in the wine. A lot of recipes vary with the amount of wine, but since this is boozy, I STARTED with 1 1/2 cups of white wine and simmered it until it was warm and fragrant. Once the wine was hot and the room smelled delicious, I added both kinds of cheese (any Swiss cheese will work, I just wanted these two kinds because they have a little bite and melt to a creamy consistency) a little bit at a time, making sure I stirred it until it melted in the wine before I added more. Once the cheese was melted and all was combined and smooth, I added the 1 tablespoon of flour. 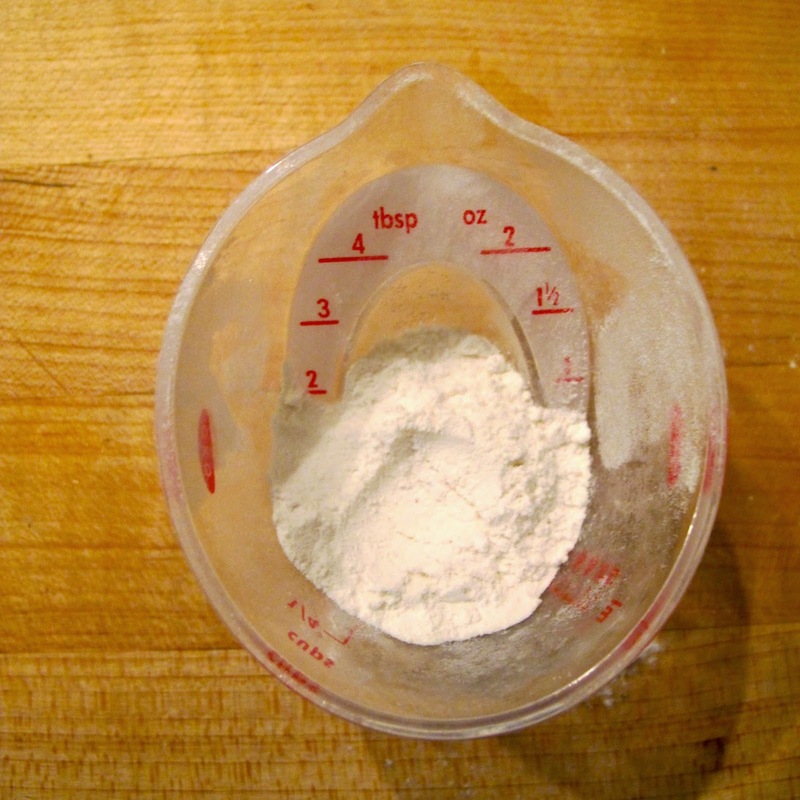 You can also use cornstarch here if you don't have any flour on hand. Its just to thicken the mixture a bit. I am a nutmeg-aholic so I added about 1 1/2 teaspoons of nutmeg - yumm - but if nutmeg isn't your thing just add 1/4 of a teaspoon or so. 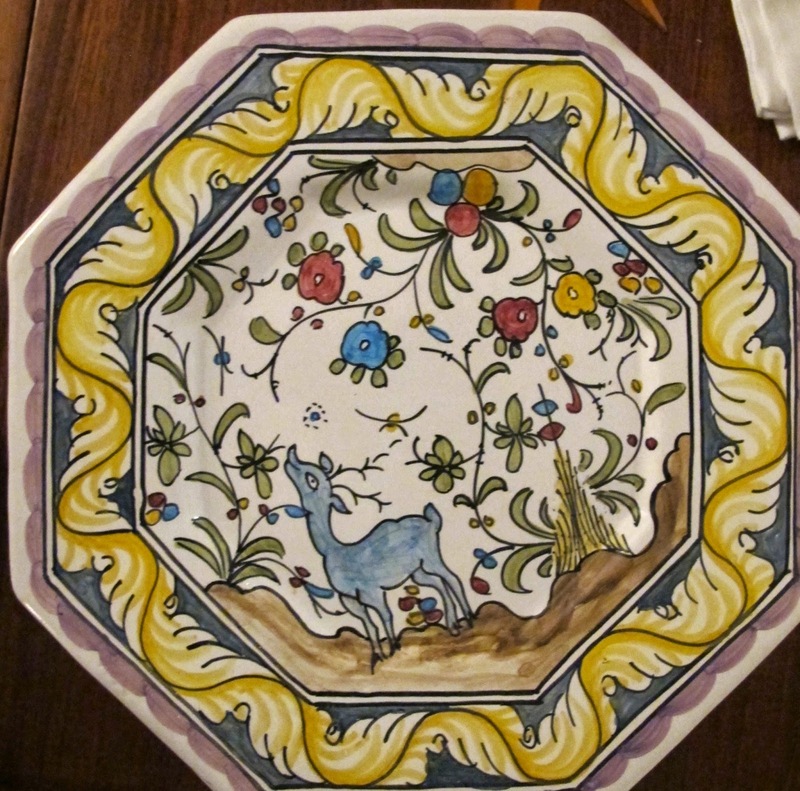 I chose my Tyrolean-sort-of-looking plates - even though they're made in Portugal. I love them for different kinds of meals. and to keep the wintry, woodsy, white theme going. I decided I'd treat myself to something that would make my life a whole lot easier. Welcome Home Electric Fondue Pot. Welcome Home! Cut the garlic and rub inside of a medium to large sauce pan. Stir in flour and blend some more. Add the seasonings and stir some more. If the fondue seems too clumpy, add wine as needed to keep thinning it out. Keep warm in your fondue pot and serve with all the cut up goodies!